Das Herunterladen von MariaDB-Dateien auf Mobiltelefone ist nicht möglich. Sie können sich jedoch gerne umsehen und alles, was Sie später von Ihrem Desktop aus überprüfen möchten, mit einem Lesezeichen versehen. MariaDB Server is the foundation of MariaDB Platform, an enterprise database platform for hybrid transactional/analytical workloads. It features Oracle Database compatibility (e.g., sequences and PL/SQL), temporal tables, transparent sharding, instant schema changes, point-in-time rollback and modern SQL (i.e., common table expressions, window functions, JSON functions and table value constructors). MariaDB ColumnStore extends MariaDB Server with distributed storage and massively parallel processing to support scalable, high-performance analytics. It can be deployed as the analytics component of MariaDB Platform using MariaDB MaxScale for change-data-capture and hybrid transactional/analytical query routing, or as a standalone columnar database for interactive, ad hoc analytics at scale. 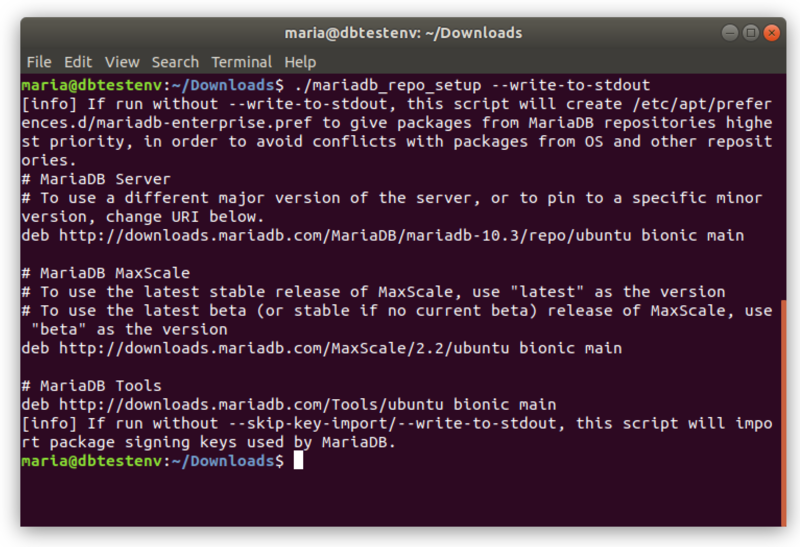 MariaDB MaxScale is an essential component of MariaDB Platform. It not only provides mission-critical applications with enterprise features including automatic failover, data masking and denial-of-service protection, it supports workload-based query routing for hybrid transactional/analytical processing. MariaDB MaxScale is available to all customers with an enterprise subscription. The MariaDB Platform Single Container Image provides all of the features and capabilities of MariaDB Platform in an easy to use single container image. Test hybrid transactional/analytical query routing, data masking, failover, and more. Intended for test and development environments this image is an easy way to get started with MariaDB Platform. MariaDB may be deployed for development or production environments using native package management tools apt and yum. Debian and Ubuntu users (apt) and CentOS, RHEL, Fedora, and SuSE users (yum) may use our universal configurator to set up your server's MariaDB package repository configuration. Once configured, you can use your native (apt/yum) package management tools to install and update MariaDB software. Lightweight, advanced connectors for high-performance data access and data streaming. MariaDB Connector/J is a lightweight JDBC driver (Type 4) for building Java applications on top of MariaDB Platform, complete with built-in connection pooling and encrypted connections via TLS/SSL. MariaDB Connector/J is LGPL. This version (2.4.x) of MariaDB Connector/J is for Java 8. MariaDB ColumnStore enables ingestion of data from various external sources through the use of Data Adapters. The Bulk Write SDK allows programmatic ingestion of data into MariaDB ColumnStore PM nodes from C++, Python, Java, and Spark applications. MariaDB MaxScale CDC Connector is a C++ library allowing your application to register as a CDC Client with MaxScale, enabling your application to receive Change Data Capture events. MariaDB provides tools that can help you to administer your MariaDB environment more easily. To use these tools in production, you need to purchase MariaDB Platform X3 Subscription that includes features such as management and monitoring tools, notification services for security alerts and bug fixes, technical and consultative support which includes 24x7 support coverage as well as performance tuning, best practice recommendations and code review. "SQL diagnostic manager is a powerful performance monitoring and diagnostics solution that proactively alerts administrators to health, performance and availability problems within the SQL Server environment." Vom Support bis hin zu optimalen Vorgehensweisen kann MariaDB Sie und Ihr Team dabei unterstützen, das Beste aus MariaDB herauszuholen.